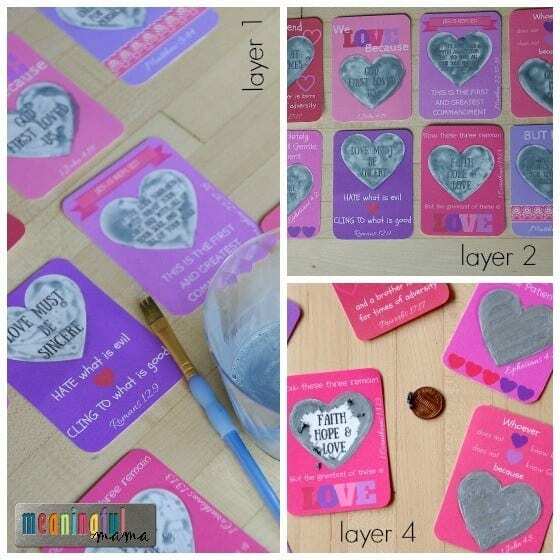 Want to make Valentine’s Day a more meaningful day for the kids in your life? 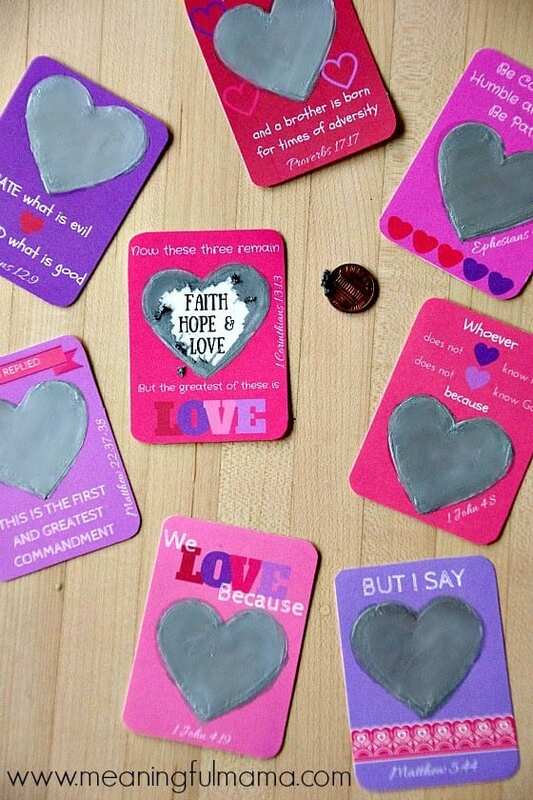 These Valentine’s Day Bible Verse Scratch-Off Hearts are such a fun way to bring the Word of God into the minds and hearts of kids. Whether these are for your own children or the kids under your care at Sunday School, AWANA or your school, I think you’ll love the scratch-off nature of this scripture-based printable. For more Valentine’s Day ideas, I encourage you to visit my Valentine tab. If you are looking specifically for Christian Valentine’s Day idea, I think you’ll love this owl printable, heart garland or this celebration of John 3:16. The LOVE tab associated with my character development series might be helpful also. I am going to use these as lunch box notes leading up to Valentine’s Day. I love that my kids get the chance to see and read through these verse, but I also love the thought that their friends will probably be interested in the notes and therefore hear a little bit of God’s word about love as well. If your kids attend a Christian school, they might enjoy making these with your for their classmates. 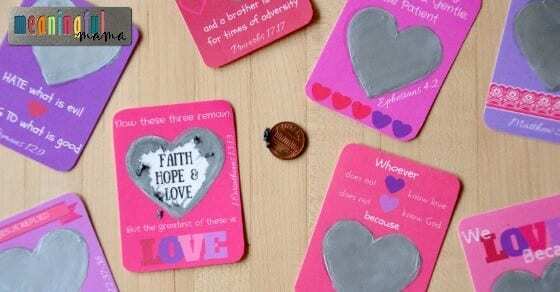 Print off the free Valentine’s Day Bible verse scratch-off hearts printable and cut to size. 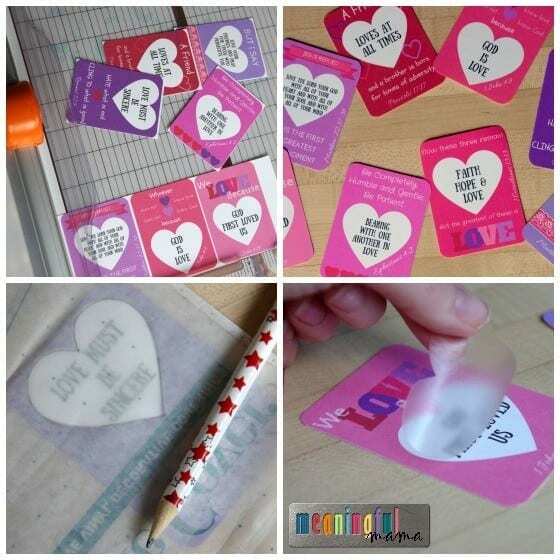 Take the clear contact paper and trace the hearts on the printable. The hearts are all the exact same size. Cut out contact paper hearts. I cut out two at a time. Remove paper backing and adhere the contact paper hearts directly on top of the heart on each individual scripture card. For scratch-off surface, combine 1 Tbsp dishwashing liquid and 2 Tbsp silver metallic acrylic paint. Paint a thin layer on top of the heart with a flat paintbrush. The first layer will look really light and not cover well. Don’t panic. Allow to dry for at least an hour and then paint a second coat with the same dishwasher soap/metallic paint mixture. Paint another coat of just the metallic paint (no dishwashing liquid added) using smooth brush strokes to avoid a streaky look. You may need one more coat after this, but make sure to let the first coat dry completely before adding another coat. Allow to dry completely before giving them to the kids. They will be able to scratch off the surface with a coin. I hope you find different ways throughout the year to celebrate scripture and allow kids to hide it in their heart. This printable and fun scratch-away surface should make your Valentine’s Day experience that much more intentional and impactful. God is LOVE. He is the author of true, agape love, and this is what we celebrate. This looks amazing! Question: by “dishwashing liquid”, do you mean liquid dish soap used when you hand wash? Or liquid soap that goes inside a dishwasher? Or does it matter? 😇. Thanks!! Hey! Thanks so much. Sorry it took me a bit to get back to you. I mean the liquid dish soap for washing hands and dishes – like Dawn. Really good question! Hope that helps!